For SATB Chorus and Optional Organ. Composed by Janet Wheeler. Choral. Hymns & Chorals. Choral Score. Composed 2016. 8 pages. Novello & Co Ltd. #MUSNOV295845. Published by Novello & Co Ltd. (HL.14048234). This introit was the winning entry for the Friends of Cathedral Music Diamond Jubilee Composition Competition, and was premiered by the Choir of Southwark Cathedral, directed by Peter Wright, on 25th June 2016. 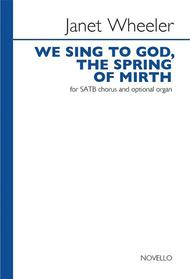 We Sing To God, The Spring Of Mirth is a work by Janet Wheeler for SATB Chorus and optional Organ Accompaniment. This introit was the winning entry for the Friends of Cathedral Music Diamond Jubilee Composition Competition, and was premiered by the Choir of Southwark Cathedral on 25th June 2016. The work sets a poem by Nathaniel Ingelo.